These are nice and sharp. Wish they were heavier, but they do the trick! The Henckels International Everedge Plus 13-pc Knife Block Set gives home chefs high quality, low maintenance knives to accomplish everyday tasks with ease. Thanks to their handy micro-serrated edge, the blades never need to be sharpened because the cutting edge between the points do not come in contact with the cutting board. The all-rounder 8" Chef's Knife is ideal for chopping herbs and dicing onions while the 5" Serrated Tomato Knife cleanly slices through tomatoes. Perfectly peel apples with the small 2.75" Paring Knife. J.A. 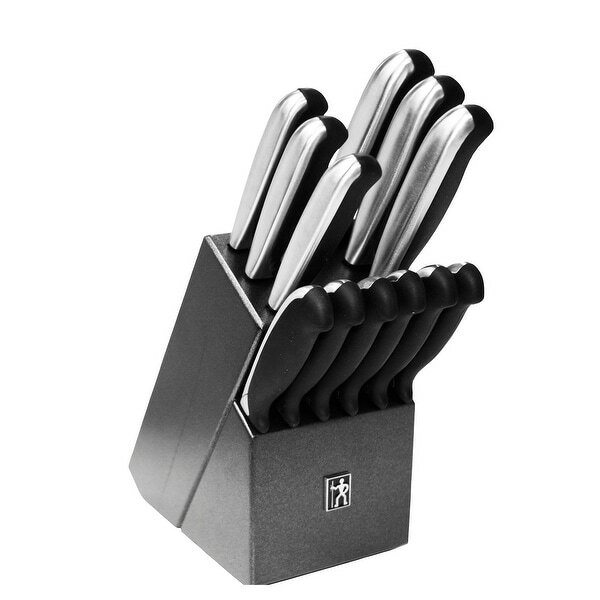 Henckels International Everedge Plus 13-pc Knife Block Set- Black/Stainless Steel has everything a kitchen needs. The knives are easy to clean and store neatly in the block on my countertop. I purchased this set for my Son who just purchased his first home. I bought a lot of kitchen necessities. These knives and block are better than I ever anticipated. Although he hasn’t used them yet they are constructed very well. The handles are heavy the blades are solid and the block house for them is so nice. Theses knives will be around along time. This is great set of knives. Made of a good quality metal that doesn't need sharping. Feels very comfortable in your hand. I would recommend this product. Attractive looking and easy to use. Does not take up much counter space. I like my knives being so accessible for food prep.